A game shop proprietor and expert gamer all around. 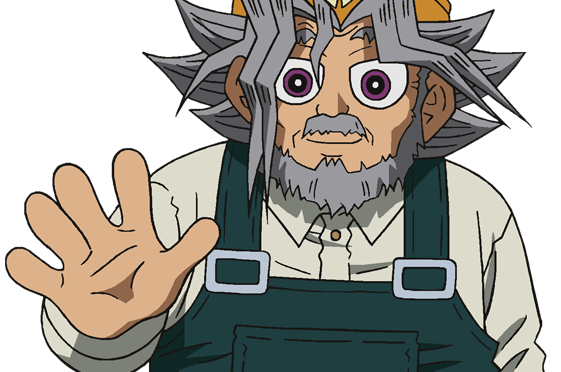 Solomon Muto (Sugoroku Motou) is Yugi’s grandfather. Not much is really known about Yugi’s parents, but we’re shown that he is raising Yugi. Solomon Muto owns the game shop below where they live. Yugi gets most of his games and other items from there. Solomon has his own mystery behind him. He’s been to America and has several friends there. He has connections to Egyptian artifacts, mostly games, and he has friends in the universities in Japan and other places. We don’t know what else Solomon has or where he’s been or even what else he’s gotten in his travels. Solomon Muto is a great player of Duel Monsters. He has a special card, the “Blue Eyes White Dragon”. It’s said that it can only be used by the person who’s heart it belongs to. Seto Kaiba tried to steal it from Yugi, and was successful in his attempt. In the end however, the heart of the card was for Yugi’s grandfather and Kaiba couldn’t use it.